Around the holidays, lots of overeating and excess drinking can wear your body down. Combine that with an oftentimes hectic array of shopping, events, parties and family responsibilities and you have a recipe for stress. This unnecessary anxiety can indirectly weaken your immune system, making it easier to catch colds from others. No one likes being sick around the holidays. Then again, no one likes to abstain from the festive foods and beverages, either, even if it means loosening a belt notch or two. No worries, guys. I have a practical solution. 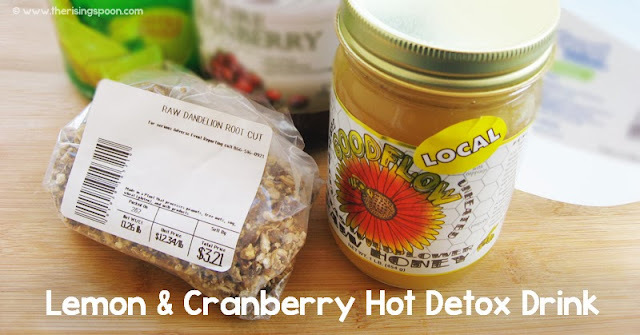 Simply add this hot lemon and cranberry detox, plus a serving of Greek yogurt with chia seeds to your morning routine. After a few days you'll start noticing a difference. It has worked for me. I've felt lighter and more energized, despite all the rich foods and wine I've partaken of in the evenings. Not to mention the homemade vegan kettle corn that I have a penchant for noshing on late at night. I have a few oil burns on my right hand after the last batch, but it was still worth it! Alongside the detox drink and yogurt, make sure to drink plenty of water, eat foods rich in vitamin C (like kiwi and oranges) and consume plenty of fiber. If you want an even stronger health boost, add in a high quality probiotic supplement that actually works. The idea is to hydrate and flush out toxins from your body while replacing them with healthy drinks, foods and vitamins that will make you feel better. In essence, the lemon and cranberry detox drink will help flush your liver and if you choose to include the dandelion root tea, it will aid in that process. Because dandelion root is a natural diuretic (like coffee), you'll lose a bit of water weight in the process. Pure cranberry juice is great for your kidneys and local raw honey, which contains pollen from nearby flowers, can potentially increase your immunity to pollen-induced allergies. As with any detox or cleanse, if you're sick (head-cold or flu), you should omit the dandelion root tea until you're feeling better. It's not smart to consume diuretics while your immune system is down. Your body will need all the fluid it can retain. I'd still recommend the hot lemon and cranberry drink without the dandelion though, as lemon and cranberry juice are full of vitamin C, which will help combat colds! "Dandelion is generally harmless unless you're allergic or have gallbladder problems or blocked bile ducts, as stated by the NCCAM. MedlinePlus reports that while drug interactions with dandelion are rarely reported, there is potential danger from combining the herb with blood-thinning agents and other drugs, and gastrointestinal symptoms also have been reported. The most common adverse side effects are dermatological in nature, such as rash and sensitivity to sun." That said, please note that I am not a registered doctor, dietician or nutritionist. If you have any concerns, check with a healthcare professional first. 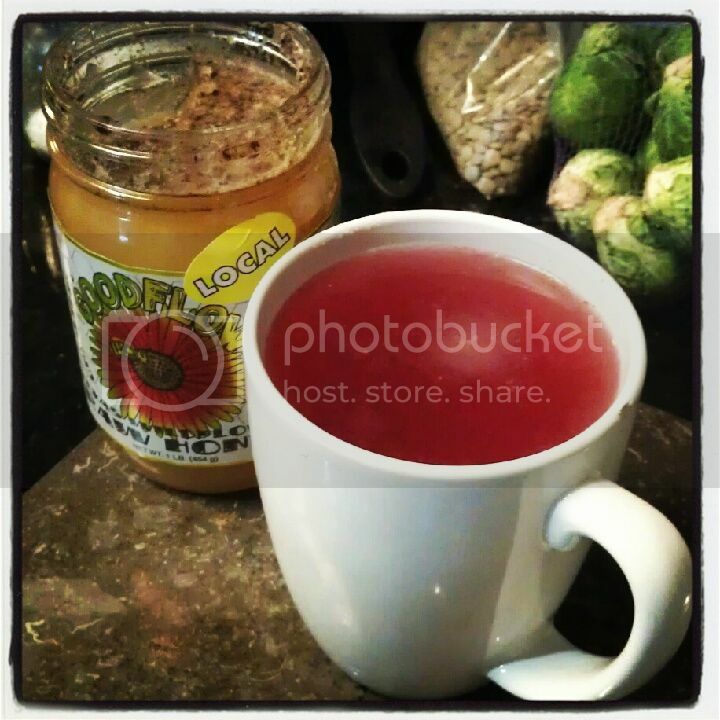 A warm mugful of pure lemon and cranberry juice mixed with a teaspoon of raw honey. This will flush toxins from your liver, supply you with extra vitamin C and aid hydration. Add in a teabag of roasted dandelion root for a stronger detox that can help you lose extra water weight. 2 tablespoons of unsweetened 100% cranberry juice (I highly recommend this brand, pictured above) --do not use cranberry cocktails! Fill a large mug with pure, filtered water. Cut a lemon in half, save the other half for later and squeeze the juice into the mug. Add in the cranberry juice. Heat the water in a pan on the stove top. When the mixture's hot, if you're interested in a stronger detox that will flush excess water, add a bag of 100% roasted dandelion root tea. This is optional, though. The drink will still hydrate and flush without the tea, just not as strongly. Let the bag seep for 5-10 minutes, then discard. Pour into a mug and then stir in raw honey, to taste. You can drink this several times a day, but it's best in the morning when you first wake up on an empty stomach. The tart and slightly sweet drink will energize and cleanse, making for a great start to the day. As always, drink plenty of clean water in between meals when you're detoxing. The more water you drink, the faster and easier it will be to flush out toxins! Full-fat Greek yogurt has an enormous amount of protein, plus good bacteria that helps your intestines. Choosing full-fat allows for more nutrient absorption when paired with foods that have fat soluble vitamins (such as leafy greens). Sweetening plain Greek yogurt with raw honey and frozen blueberries instead of refined sugar gives you more nutrition for your calories. Sprinkling in a tablespoon of chia seeds adds extra fiber, protein and omega 3 fatty acids. *If you're looking for an extra boost to heal your gut, I highly recommend taking this probiotic supplement. I've had crazy good results from it! Mix everything together in a small container or bowl and let the yogurt sit for at least ten minutes to allow the chia seeds to plump up. They expand as they absorb moisture from the liquid they're in. This is worth the wait, as when they're plump, they'll fill you up more. Alternately, you could mix this the night before and it'll be ready for you in the morning. Feel free to substitute you favorite fruit or sweetener here. The most important thing is the yogurt. It has lots of protein and is full of good bacteria that will help your intestines. Want more detox tips? 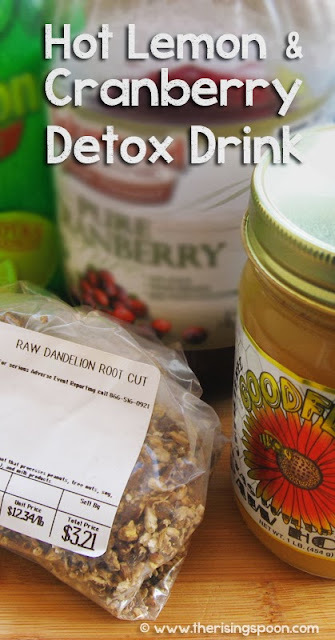 Check out my post 15 Ways to Detox Naturally Without Starving Yourself or Going Broke. Do you change your eating and drinking habits after the new year or prefer to wait til spring?